Description This Lithia Springs, Georgia hotel has an indoor pool, free internet access and non-smoking guest rooms. Complimentary extras like breakfast weekday happy hours and Wi-Fi keep guests happy at the non-smoking Comfort Inn & Suites Lithia Springs. 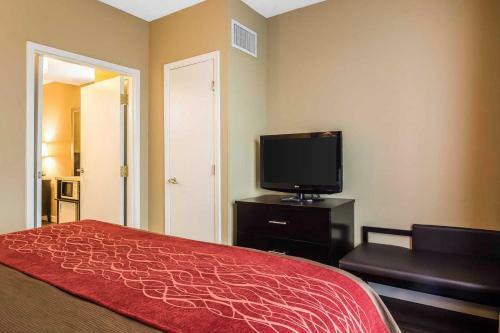 All 91 rooms at the five-story Comfort Inn & Suites Lithia Springs include coffeemakers cable TV microwaves mini-fridges and free Wi-Fi. Wake up and indulge your taste buds at the hotel's free breakfast buffet featuring an assortment of meats bagels eggs yogurt fresh fruit coffee and more. On weeknights (Monday through Thursday) the hotel hosts a complimentary reception with drinks and light snacks. An on-site fitness room helps guests stay in shape and there's also an indoor pool and hot tub. The 24-hour business center is a boon for work travelers interested in checking email sending faxes and making photocopies. Parking including ample space for RVs is available. The Comfort Inn is off I-20 14 miles from the heart of Atlanta. Nearby points of interest include Six Flags Over Georgia three miles away and Arbor Place shopping mall nine miles away. Guests are a half-hour drive from downtown Atlanta attractions like Centennial Olympic Park the CNN Center the Georgia Aquarium and the World of Coca-Cola. Hartsfield - Jackson Atlanta International Airport is 15 miles from the hotel. 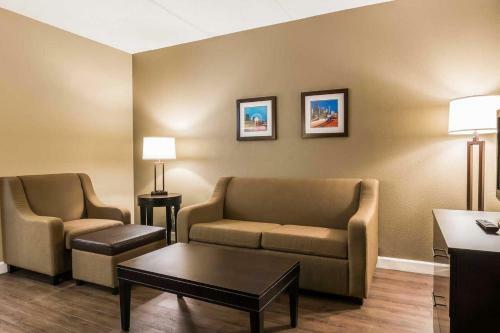 Add Comfort Inn & Suites Lithia Springs to your free online travel itinerary.